After months of research and preparation, my husband Tom and I made a sweeping change and moved to a wonderful city where moose are born in parking lots. We opted to drive instead of fly, a decision I will forever be thankful we made. It was a truly epic road trip through some of the most ruggedly beautiful and sparsely populated areas of North America. "If you are old, go by all means; but if you are young, wait. The scenery of Alaska is much grander than anything else of the kind in the world, and it is not well to dull one's capacity for enjoyment by seeing the finest first." These two might as well have been pieces of luggage. They slept nearly all day of every 9 days in the car. Vibrant yellow rapeseed (horrible name) fields blanketed much of the North Dakota countryside. It's apparently used in producing cooking oils and animal feed. Residents of Donnybrook, North Dakota. BAM! We hit mountains. The Canadian Rockies to be exact. Widely considered one of the best scenic drives in the world, Icefields Parkway is a 144-mile stretch of winding two-lane highway linking Banff to Jasper. It was impossibly, overwhelmingly beautiful. The road itself feels swallowed up by the soaring peaks, snaking its way through an alpine paradise of such scale we felt like specks of dust. 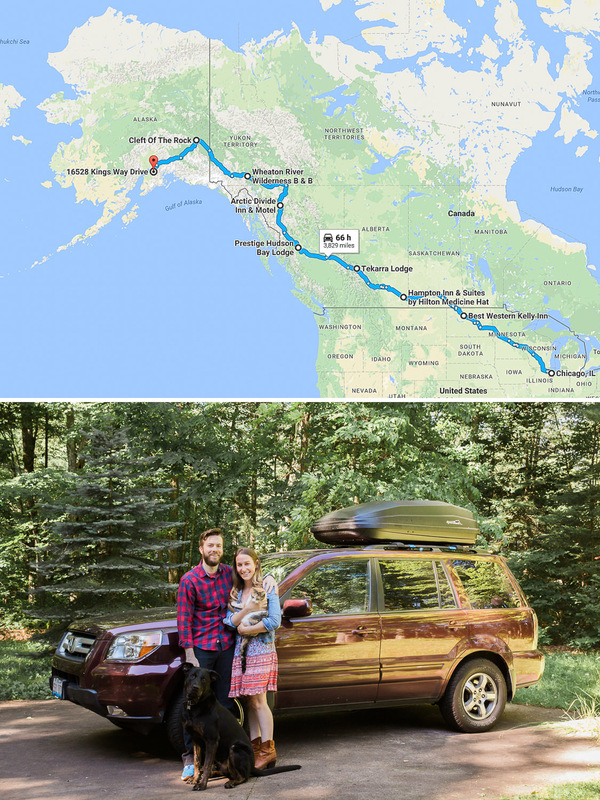 We're so grateful to our friend Dacia (who has done the Chicago > Alaska drive several times herself and who was instrumental in making our entire move a success) for suggesting we reroute our original itinerary to include this area. The road rises to near timberline at various points, with the high-elevation weather turning on a dime. In the four hours it took us to drive Icefields Parkway, conditions changed dramatically several times. Left: Crowfoot Glacier. Right: An indicator of the dramatic retreat of Athabasca Glacier. We spent two glorious nights in a tiny cabin nestled in Jasper National Park soaking up some much-needed R&R. Heaven! The whole stretch from Jasper all the way to Anchorage was jam-packed with animal sightings, certainly not restricted to wildlife corridors. Nonetheless, I became giddy with anticipation each time we passed one of the yellow signs. There is something so exhilarating about locking eyes with a truly wild animal, something I had not experienced before this drive. Some encounters were fleeting, while other times we were gifted with several minutes of curious interaction. Absolutely magical. As if we hadn't taken on enough adventure as is, we decided to make a detour and drive a 400-mile stretch of the very remote Cassiar Highway up through British Columbia. We'd read countless warnings about how wild and poorly maintained the road was, suggesting that travelers carry their own gas (which we did) due to lack of facilities along the way. A friend of Tom's family who grew up in Anchorage drove it 15 years ago and described the driving as "heinous". But the Cassiar is surrounded by vast areas of pristine wilderness, so we were determined. Plus, Milepost, the "Bible of North Country Travel" and an indispensable resource for anyone traveling in this part of the world, stated that the road had been dramatically improved in recent years; which quelled our fears...somewhat. We stopped in Kitwanga, the turn-off for the Cassier, to top off on fuel and grab a bite at the gas station diner. As we sat waiting for our breakfast in silence, Tom asked: "Are you nervous?" fishing not just for my answer but for me to ask him the same. We were both a mess of nerves, wondering why we'd voluntarily taken on such a daunting route. Tom armed with a ponytail and satellite phone (just in case). A few deep breaths later and singing our favorite tune, we turned onto the Cassiar. A perfectly paved two-lane highway, complete with shoulders and lane markers stretched before us. So what was all the fuss about?! We'd learn 200 miles later. Pull off the Cassiar and you're greeted with views like this. Towns isn't the right word; the stops along the Cassiar are more like outposts than anything else. In Dease Lake we had one choice for dinner: The Shack. Most of the bridges along the Cassiar are one-way. Not that it caused any inconvenience as we encountered so few other vehicles. After being a resident of Anchorage for about a month now, I'm amazed at how relatively "tame" the moose are here. It's important to give these massive animals a wide berth, of course. But even when doing so they will often walk right up to our house (when we're in plain view), or stand along the side of the road grazing while traffic buzzes by. Just the other day, I had to wait while a cow and her two calves crossed the street directly in front of the car in order to pull into our driveway. 1) Mom immediately freezes when she sees our car. 2) Baby, on the other side of the pond, senses something is not right and looks to mom. 3) Baby jumps in the water and swims to mom. 4) Mom gives us the stink eye for interrupting her evening swim. 5) They rush off into the woods. 6) Mom turns back to give us one final stink eye. How I grew to dread this sign with the squiggles. We'd read about frost heaves during the planning process, but weren't prepared for the stress they'd bring to the driving experience. Mother Nature really flexes her muscles with this phenomenon; she basically annihilates roads that sit atop permafrost, causing them to lift and buckle in really gnarly ways. Think speed bumps on steroids. We couldn't take our eyes off the road; while some areas of frost heaves were marked, many were not and you could easily rattle your car to the point of rendering it undrivable if you hit one too quickly. The second (northern) half of the Cassiar is the portion that didn't see the dramatic improvement that we'd read about. The road narrows to one lane, shoulders and guardrails disappear and pavement becomes riddled with potholes and frost heaves. Top it off with some steep grades, switchbacks, stretches of gravel/dirt in lieu of concrete and 35 mph becomes your top speed. Needless to say, this portion along with several stretches of rough road on the Alcan made for some challenging driving. Rare moments of alertness from our sleeping beauties. The legendary Yukon Territory. This place captured my heart and soul. It feels good to feel small sometimes. Tom in Kluane National Park. A place we will never forget. We stayed in the guest cabin of a young family of Swiss homesteaders that live deep in the wilds (which they aptly named "The Far Side") outside Whitehorse. No plumbing, no electricity, truly off the grid. Orin escorting me to the outhouse. This enormous black bear was easily twice the size of the other half dozen we'd seen earlier in the drive. He was also unusually unafraid (the others retreated pretty quickly upon spotting us). He let us pull the car right up next to him as he munched on grass. Such an adrenaline rush! One last bit of Yukon. After presenting our passports at the border, the customs agent greeted us with a hearty "Welcome home!". Which was funny, because I'd never felt farther from home. Although proposals began back in the 1920s, the Alaska-Canadian Highway wasn't built until 1942. It took the attack on Pearl Harbor and the US being drawn into WWII to spur its construction. Worried the Japanese would follow the invasion of Hawaii with Alaska's Aleutian Islands, a bold plan was drawn up to build a 1,400-mile supply road through the harshest landscape in North America in just 8 months. Canada agreed to it under the condition the US bear the full cost, and release it to Canadian authority once the war ended. One army colonel characterized it as a feat of engineering second only to the Panama Canal. After having seen the rugged country this road cuts through, and reading about the conditions these men were met with (temperatures of minus fifty being one) as they completed this mammoth project, I remain in complete awe. Left: We spent our first night in Alaska in a perfect log cabin in Tok (pronounced with a long "o" like Tokyo). We awoke to the howling of 50 sled dogs waiting for their breakfast. Turns out an master dog musher lived just down the road. Right: The jaw-dropping final stretch into Anchorage via Glenn Highway, which affords sweeping views of Matanuska Glacier. We made it! Home sweet home at our new digs in Bear Valley, sipping the most delicious tap water. We've since learned that Anchorage's drinking water is sourced from a pristine glacial lake north of town. That explains it! Top: Cook Inlet from the Coastal Trail in downtown Anchorage. Bottom: Cook Inlet from our backyard in Bear Valley. A backyard where a grizzly mom and her two cubs took down a moose two weeks prior to our arrival. Not an especially comforting piece of information to learn from our neighbors the day we moved in. Since then bears have been out of sight, but never altogether out of mind. Two things I never imagined I'd see on a daily basis. We're still marveling at the fact that we live in postcard. And don't anticipate it ever getting old!